The content in this book for teaching and managing elementary to eight grade students includes vignettes, curriculum topics and instruction, educational diagnoses, and positive management programs to help children with behavior disorders. 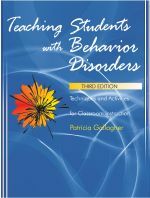 You will find 12 strategies for general and special education teachers to help students achieve academic and social success along with 10 psychological variables in the classroom environment that impact student behavior. Based on a perspective combining psychoeducation, behaviorism, and structure, the book contains classroom examples, forms, and illustrations. It is a warm and inviting book containing workable ideas to help troubled children succeed.